There are several things to take away from the playing of the first FedEx Cup playoff event this past weekend at The Barclays. 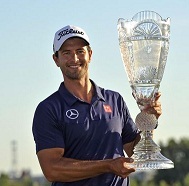 Obviously the first should be Adam Scott winning the event, getting his second victory of the season. This win for Scott probably meant quite a bit, because while he has been in contention plenty since winning the Masters in April, he hasn’t been back in the winner’s circle. The victory is a nice complement to that Masters win in which he was moving on from the first Major championship win. After he finished his round, Scott probably didn’t think he was going to win. After all, scores were pretty low out there and the leaders started the day at 12-under, which was one ahead of Scott who finished at 11-under. Scott completed his round a little less than an hour before the final pairings came through, and had to dodge plenty of bullets to have things go his way. One of those bullets was Tiger Woods. But this was a Woods who was struggling coming down the stretch. Not with his game though, with his back. We were left wondering if he would be able to complete the round. This was especially true after his second shot to the par-5 13th in which Woods went to the ground after a back spasm. The ball ended 50 yard left in the water which led to a bogey. Somehow Woods was able to regroup, and after it looked like he was out of it standing on No.16, he proceeded to birde both No.16 and No.17. He needed a birdie to tie Scott to force a playoff, but came up an inch short on a 40-foot putt. The last of the bullets to dodge was Gry Woodland, who came in tied for the lead. Woodland left himself a 10-foot birdie putt on No.18 which he pulled left. And just like that, Scott had the win. He watched from the driving range with caddy Steve Williams, and saw the end result on the big screen. Scott moves to No.2 in the FedEx Cup points standings after the win, behind only Woods. Aside from moving on to the second playoff event next week in the Deutsche Bank Championship, the main storyline will be whether or not Wood will play this one. If his back is unable to go, it’s likely we won’t see Woods until the BMW Championship or perhaps even further than that to the Tour Championship. This entry was posted in News, Opinion and tagged adam scott, Deutsche Bank Championship, fedex cup playoffs, the barclays, tiger woods on August 26, 2013 by Bryan.